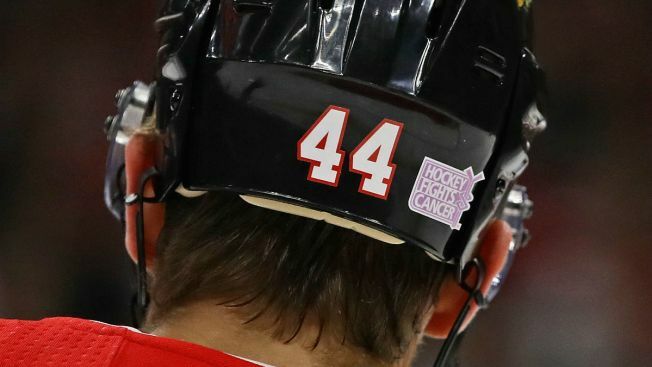 The Chicago Blackhawks will honor broadcaster and former player Eddie Olczyk with “One More Shift” at the United Center Sunday as part of the team’s “Hockey Fights Cancer” night. Olczyk, who battled stage three colon cancer last season, will be the latest former Blackhawks player honored in this way, as he takes the ice before the team’s game against the Minnesota Wild. The Blackhawks will also host a special Purple Carpet event in the United Center atrium before the game, honoring Blackhawks fans who are battling cancer or who have lost a loved one to the disease. The first 10,000 fans entering the United Center for the game will receive a Blackhawks cancer awareness hat. During pregame warm-ups, players will wear special lavender jerseys, and will autograph them when they come off the ice. Those jerseys will then be auctioned off on the team’s website. All proceeds from the sale of the jerseys will go to local cancer-related organizations. Finally, the team will honor five local children during the National Anthem through a partnership with the Make-A-Wish Foundation and Bear Necessities. Fans attending the game will also have the chance to buy special “Hockey Fights Cancer” t-shirts, special autographed pucks, and Split the Pot tickets, and proceeds from those sales will go to a wide variety of organizations dedicated to spreading awareness and conducting cancer research.